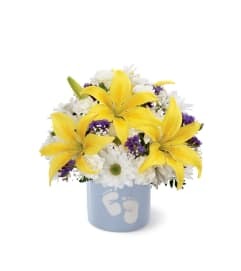 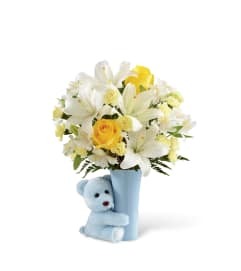 The FTD® Little Miracle™ Bouquet is the perfect way to welcome the newborn into the world and help the family celebrate on this most momentous occasion! 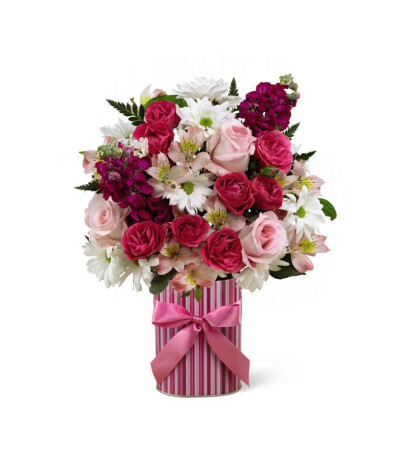 Bringing together pink roses, hot pink spray roses, pink Peruvian Lilies, white traditional daisies, fragrant fuchsia stock and lush greens, this stunning flower bouquet exudes warm wishes and sweet sentiments. Presented in a designer striped pink container accented with a satin pink ribbon on the front, this beautiful mixed flower arrangement will be a memorable gift for the new family.